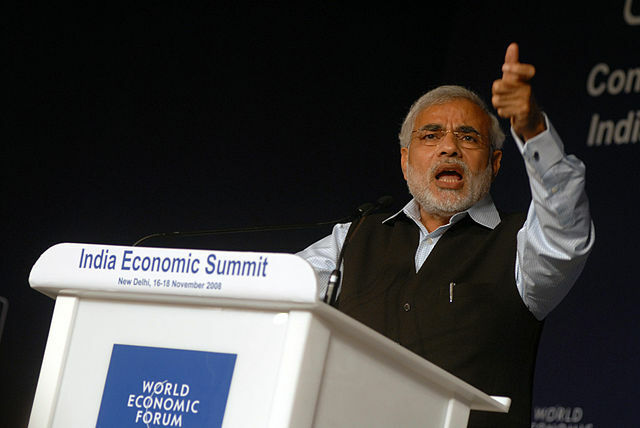 Earth Stumbling: Is Narendra Modi green? Did anyone else believe that Narendra Modi would just go away? I mean, even after his feature in Time magazine, I honestly thought he was just going to be a flash in the pan. This apparently is a long drawn out flash. Actually, a few weeks ago I finally read the Time magazine article about Modi, and it actually made me have some feelings for Gujarat's Chief Minister (who did not prevent nor properly preside over investigation of the apparent genocide which occurred in his state, FYI). This post, however, is about the environment and the Indian political system, and I'll keep it brief. To answer the main question, yes apparently Modi can be considered green and unabashedly so, one-upping Al Gore by declaring that the issue of climate change is not an "inconvenient truth" but that we can take "convenient action." He calls his state a "game changer" for alternative energy, making it a "world capital" for solar energy. His vision is to have solar power rates equal to coal or gas by 2017. This is big environmental talk for a major political leader. This is in contrast to US presidential candidate, Mitt Romney, fearlessly declaring, "I'm not in this race to slow the rise of the oceans or to heal the planet." America is at a very different place in how politicians need to place themselves on the green scale. Modern India since the Stockholm conference in 1972 has an established position on the environment, even re-injecting the nation's constitution with green principles and presently mandating environmental education for all students across disciplines. Plus, India claims a green ancient history, due to the Hindu tradition of involving nature in religious practice and philosophy. Therefore, it is almost assumed that politicians will be green in nature. However, Modi seems to go beyond this, aiming to put his money where his mouth is. With coal and energy scams in plenty in the Indian political system these days, for the Chief Minister to lay out clean affordable energy initiatives is quite a promise. For young entrepreneurs looking for both stable infrastructure for successful business as well as a sustainable future Modi seems like India shining. This is because with Modi it seems that India can have economic growth with environmental conservation. However, the original Brundtland Commission definition of true sustainable development includes a third area of concern--social equality. With Modi's spotty past of communal violence (the US still won't give this freely elected Chief Minister a visa), does he also have big promise for social equality for all? Or does that part of sustainable development not really matter? If Modi seems like he can drastically improve India's economy, like many other nations, maybe a few will need to suffer. A growing prosperous middle class seems to pacify past communal tensions. Maybe with enough money floating around this whole genocide thing will eventually go away. Hey, at least with Modi we'll go solar. Note: This post was updated from when originally posted. Our country today requires a lot of leaders of at least Narender Modi's calibre who can inculcate discipline at grass root level as a prerogative in all walks of life for a common man to feel free and safe as an Indian national . Growth will automatically be there.